How I Gained It: I have always been a big guy. I remember weighing 124 pounds in fourth grade and thinking, “am I overweight?” By high school, I was wearing size 40 pants and extra-large shirts. By college, I was at a size 46 in pants, a 2XL shirt, and weighed 280 pounds. This was the first time I decided to lose some weight, and I was successful. After about seven months, I was at 215 pounds. However, I stayed at that weight for about two months and I started to slowly gain weight the weight back. Going out, drinking, eating at all hours of the night and no excersice made my waistline expand fast. Over the years, I spent most of my time playing an online game, eating fast food and making a impressionable dent on the sofa. Then, I decided to quit my job, leaving more of my spare time for my wonderful relationship with my couch and online game. My breakfast would usually consist of two bowls of cereal, or an omelette with three pieces of cheese, three eggs, and two or three pieces of toast with extra butter (of course). Lunch would be usually at a fast food joint. I would eat various meals, but I can tell you that the lunch was usually above 1,000 calories. Dinner would be fast food or maybe Chinese food. Over time, I became very inactive and even snacked on junk food through out the day. My waist size went up to a whopping 50 and my shirt size was about to be at a 3XL. I became depressed, did not get a haircut for about a year, and would rarely go out anywhere. I felt extremely fat. (Fat was an understatement, really.) I would wear all black and I would always ignore mirrors. I could not make it up the stairs to my apartment without being out of breath. More importantly, I delveloped high blood pressure and was on the road to disaster. Breaking Point: I woke up on January 1, 2010 and decided to weight myself after a long night of drinking and eating junk food. When I got on the scale (I had not weighed myself for a long time) the scale read a whopping 310 pounds. I almost began to cry. I coud not believe I weighed that much. I was disgusted with my body. I stood there, naked, looking at my body and how I thought it was disfigured and lumpy. I told myself at that moment that I was going to lose the weight — and this time, keep it off. I was worried because the last time I dieted, I literally starved myself. I would only eat about one meal a day and drank a lot of water. That was about the only diet I have ever done, and frankly, it did not work, considering I gained a lot of weight back. So this time I knew I had to be dedicated and committed to losing weight. Also, my family has a history of diabetes, hypertension, and because of bad eating habits, my mother is on dialysis. I was determined to not to fall prey to my family history. How I Lost It: I knew if I wanted this to work, I would have to change my mentality. I decided not to go on diet, but a lifestyle change. First, I started eating egg whites and turkey for breakfast. For lunch, I would eat chicken breast with white rice and brocoli. Dinner was similar to lunch. I did not count calories but stayed away from a lot of starches. I typically stayed with white or brown rice. Instead of eating a sandwhich with white bread, I would eat a sandwhich with wheat bread. Also, I did not eat fast food or drink sodas, and stayed away from sweets. Lastly, about once every two weeks, I would have a day where I could eat what I wanted, just not a lot of it. For example, if I went to McDonald’s, I would eat a kids’ meal. In about two-and-a half weeks, I had dropped about 15 pounds. I felt great! Then I realized that this would only continue if I exercised. I decided to start walking on the treadmill. I did not have a particular exercise program I was doing, I just did my own thing. I would exercise about three times a week for about thirty minutes at a time. The weight did begin to shed off quickly. I decided to begin jogging rather than walking. The first time I jogged, I nearly passed out after 20 seconds. I continued to monitor what I ate and exercised. Around February of 2010, and with the start of my new job, I was at 278 pounds. At this point, I was able to run about a mile in 14 minutes, and I was ecstatic. Eating healthier and choosing the right foods became easier. However, I knew I had a long long way to go. Of course, everyone is not perfect. There were times where I grabbed an extra slice of pizza. But the way I see it, if you indulge in those cravings at times, you will be more likely to control how much you eat of those cravings. If you don’t indulge in those cravings, it is possible to go on eating binges. 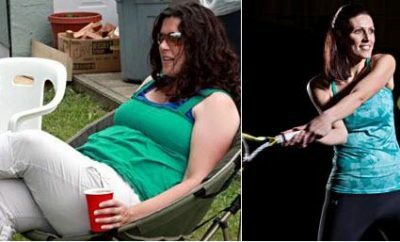 In April of 2010, I joined a gym and eventually started taking Zumba classes, which I am happy to say I still attend. 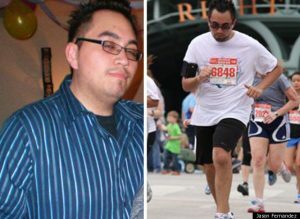 By June of 2010, I was down to 250 pounds and I could run about two miles in about 25 minutes. I continued with my new lifestyle, and completed my first 5K in October of last year and my first 10K in March of this year. I’m currently signed up to do a half-marathon January of 2012!